Random notes I took shortly after reading the book. Capote has the best ear for dialogue since maybe Oscar Wilde, and a talent for the off-hand aphorism to match Andy Warhol’s. And please note the cleverness in picking my points of reference. Breakfast at Tiffany’s is a novella (just short of the hundred-page mark) taken up largely by dialogue, in size and structure looking almost as a play―and it’s no wonder that it should be made into a film. Some of the plot’s best ideas would, and as far as I can remember did, sound as effective in screenwriting. Several questions arise. How much of the plot is autobigraphical, to some extent or other? Not just in the character of Rusty Trawler, but in the whole Southern dimension of the story; plus the biographical elements of Lulamae/Holly, who just like Capote is born and raised in the South and then transplanted to NY as a socialite. And speaking of the protagonist, how much did Capote wish to have the same irresistible effect on men that Holly had? On the other hand, how much of Capote is there in the narrator? Who has incidentally no name throughout the story, except for the multiple borrowed names Holly lends him―which collectively amount to nothing. If I hadn’t read Breakfast at Tiffany’s right after The Great Gatsby, perhaps I wouldn’t be writing the following words. But I did and I will. Both stories are told in the first person by a narrator who looks up to and admires the protagonist, to the point of constructing him/her as better characters than they really are; the narrator in turn presents himself as the anti-protagonist. Jay Gatsby and Holly Golightly are both very successful NY upper-class socialites, are in fact possibly the most talked-upon figures in their orbits, and both hide a childhood and youth lived in extremely poor environments. The respective historical periods (the Twenties and World War II) are very much present, if only as background to the endless stream of parties. Both stories are portraits of the society of their time, and of America at large, as well as commentaries on the American Dream; but while Gatsby’s social climb is doomed, Golightly always manages to stay afloat (she’s “top banana” not only “in the shock department”) even if by eloping with men that she openly, and repeatedly, defines as “rats”. The Great Gatsby is tragedy; Breakfast at Tiffany’s is comedy. There’s moreover in both cases a particular focus on the season(s). 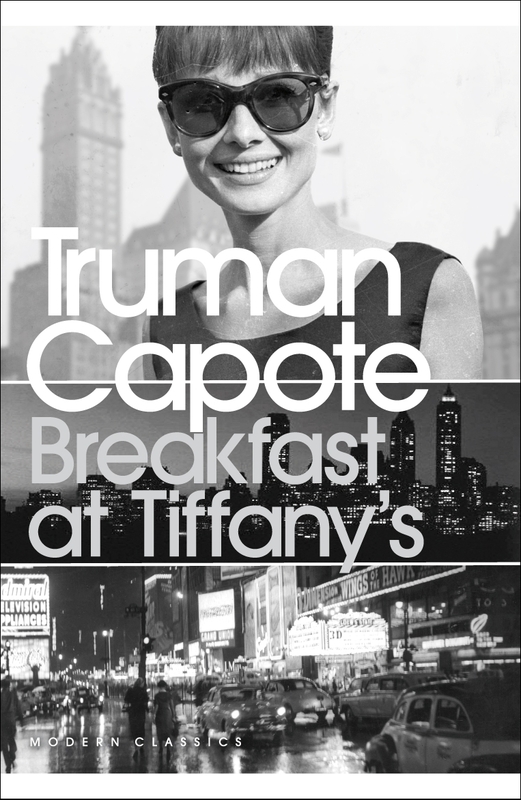 In this edition, Breakfast at Tiffany’s is published with three other short stories. Their overall feeling is akin to that of certain music albums whose first side is taken up entirely by a single piece, while the second side offers some compositions as side dishes. These latter do not add anything to the final value of the product, if anything they fall short of the main piece in terms of scope, beauty, quality; yet they’ll entertain you for several minutes. One cannot help but feel they’re there only to fill up space (either pages or vinyl). Think of Alice’s Restaurant: in that case the main song gives the title to the whole collection, too. This was written by alessandro montagner. Posted on Friday, June 28, 2013, at 08:00. Filed under English, LETTERATURA, Narrativa. Tagged film, humour, New York, novella, Penguin, Truman Capote, U.S.A.. Bookmark the permalink. Follow comments here with the RSS feed. Post a comment or leave a trackback.